OS: Ubuntu 12.04 x64 - ALL updates made! How are you importing data to this cluster? You probably are trying to run one huge transaction, which chokes the first node. If so, try to figure out a way to split your import into a series of reasonable size transactions. It was not a very big transaction: GCache page created was only 128MB. How easily this can be reproduced? thank you for you quick replies! data is imported "locally" via mysql client. i tried it with 3 nodes, and just with one in bootstrap-pxc mode. the line is not everytime exactly the same, so i think it is not a single "INSERT" statement that is wrong. oh, with a 5.5 version this was no problem! just this "brand new" 5.6er version has troubles. what other info do you require? 2) Any chance for us to get hands on otrs_prod.sql (the first part that crashes the cluster)? How many insert statements on average does it go through before the crash? Does it always crash when inserting to same table? Can you show the crashing table definition? The Cluster is in testing-phase and therefore shouldn't be problem to test "your" binaries. Sorry, no, this is not possible. This data may not leave the company. It should have 23076 rows, but it mostly crashes around 20233 (+/- 30) rows. - first, the article table is filled. there are 9450187 rows, it is about 16.7 GByte large. - second, the article_attachment table is done,23076 rows. it should be about 2 GByte large. it always crashes at this table. i will try to create a new export only of the article_attachments table, which i will try to import into the cluster. 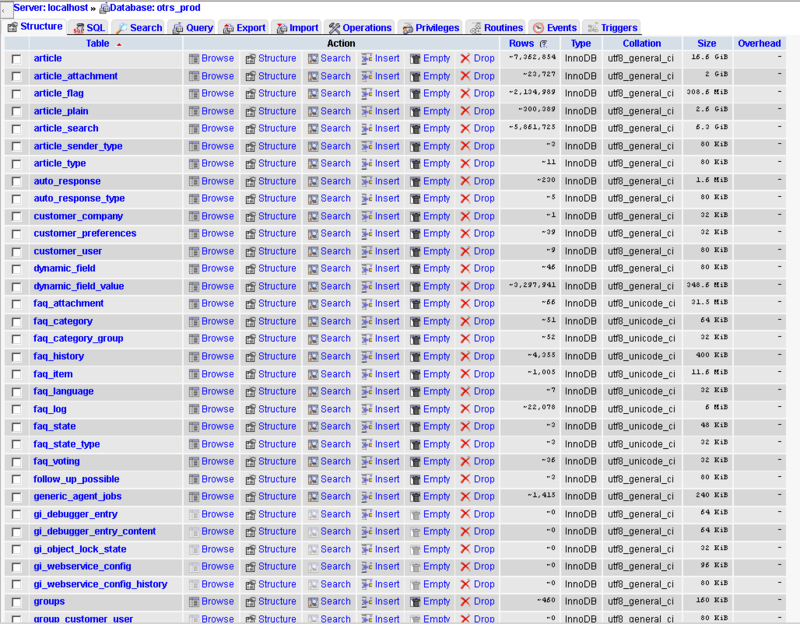 oke, i just imported ONLY the article_attachment table. except, that this time it crashes with signal 11, not 6.
could HW-acceleration be the problem since this is a VMWare box? 2014-01-10 15:14:37 8029 [Note] WSREP: wsrep_load(): Galera 3.2(r170) by Codership Oy <email address hidden> loaded successfully. 2014-01-10 15:14:37 8029 [Note] WSREP: CRC-32C: using hardware acceleration. 2014-01-10 15:14:37 8029 [Note] WSREP: Using CRC-32C (optimized) for message checksums. All 23076 rows can be inserted! Nice. OK, that worked as well. 2014-01-11 01:32:55 12174 [Note] WSREP: wsrep_notify_cmd is not defined, skipping notification. 2014-01-11 11:24:11 14543 [Note] /usr/sbin/mysqld: ready for connections. 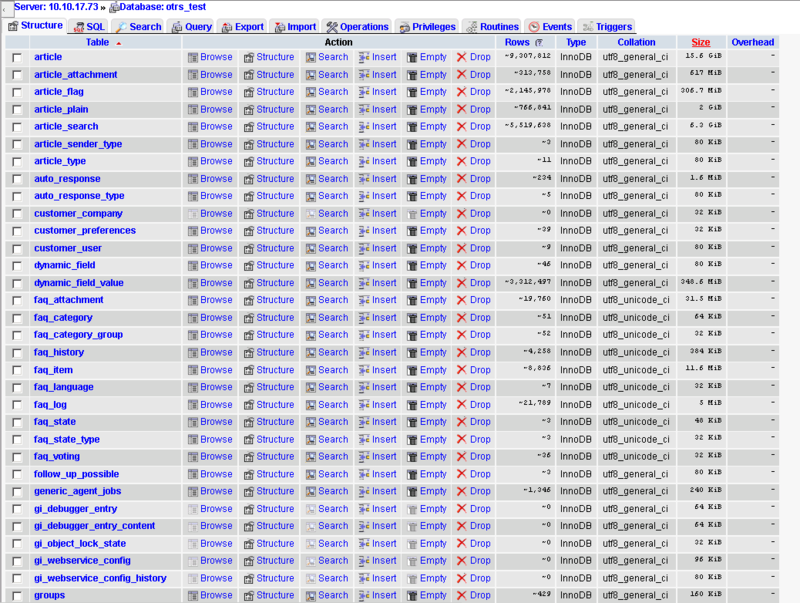 If i start the node with "/etc/init.d/mysql start" it looks like the configfile is not or half read???? some vars are set, some not. This is really not a stable environment. oops! I found something very strange! The Server loaded all data, but the table size is by far smaller! ???? CRC acceleration can't have any effect there, it is engaged only at replication stage. The crash happens way after. I would not worry about physical size on disk that much - 5.6 may be using different file format. What's important is the number of rows and table definition. Could you please try with the attached galera binary, it is unstripped debug build. Also would be great if you could attach to mysqld process with gdb before running the load and print the stack trace when it crashes? Thats what I said. Somehow the my.cnf file is NOT fully loaded. See #9. But the question remains why the SAME config is working with percona-56 but not with "your" binaries. mysqld: galera/src/certification.cpp:94: void galera::Certification::purge_for_trx_v3(galera::TrxHandle*): Assertion `ci != cert_index_ng_.end()' failed. oh, now it chrashed in an other table! but the next one, article_plain, crashed. it should have 27406 rows, but has only 24876. Hi Axel, thanks for the stack trace, it is very helpful. I'll be offline for the next 5 days, hopefully I'll come up with solution by then. Adding galera to the bug since it is crashing there. It looks like the size of writesets makes a difference. I was having exactly this problem in exactly same situation; importing large DB to a new cluster and having that same crash. Setting wsrep_provider_options='gcs.max_throttle=0.0;gcs.fc_limit=512' as a work-around let me import the data. I don't see how gcs.max_throttle may help there, but a low enough gcs.fc_limit will lessen applying concurrency... so that may be helping. thank you for your answers & hints. I didn't have time to test these settings. We are using for now Version 5.5. Any idea when the bug will be fixxed in 5.6? Hi Axel, I still didn't have a chance to look at it in depth. However, Percona made a PXC 5.6 release few days ago. While it does no fix this bug specifically, it may have better chances of success. A duplicate, but no VMware involved: https://mariadb.atlassian.net/browse/MDEV-5720 Let me know if I You need more information. sorry to bother you again, but we really need a solution by now! Can you please tell me when we can expect an update or fix for this problem? Our customer is not amused about the situation and is urging for a solution. Looks like it was of-by-one error in certification index cleanup. hmmm, just tried it again with the newest ubuntu package available. 2014-04-03 10:13:37 8593 [Note] WSREP: wsrep_load(): Galera 3.4(r176) by Codership Oy <email address hidden> loaded successfully. 2014-04-03 10:13:37 8593 [Note] WSREP: CRC-32C: using hardware acceleration. 2014-04-03 10:13:37 8593 [Note] WSREP: Using CRC-32C (optimized) for message checksums. > 2014-04-03 10:13:37 8593 [Note] WSREP: wsrep_load(): Galera 3.4(r176) by Codership Oy <email address hidden> loaded successfully. tell me that there is no to install/upgrade. The 3.6 package is now available in debian experimental repo. https://launchpad.net/percona-xtradb-cluster/+milestone/galera-3.6 is the milestone associated with it.